It's the final night of our new products, and we wrap up with Jennie Atkinson who has some lovely ideas with JoFY's stamps to round up yet another wonderful release. We don;t normally do this many stamps at Christmas, but the designers were all keen to stir up a Christmas frenzy, and what a lot of treats we have been given! We hope you contact one of our stockists to get hold of something that tickles your fancy, and start planning your Christmas ideas too! All these new products are available from your PaperArtsy stockists now. See details in the stockists list at the foot of this post. Hi everyone, Jennie Atkinson here. Christmas in our house is very much about "made for you" presents with both my husband and I making presents for each other and other members of the family. I do like all my family to have a handmade card I but am normally not that organised to be making them in September ! 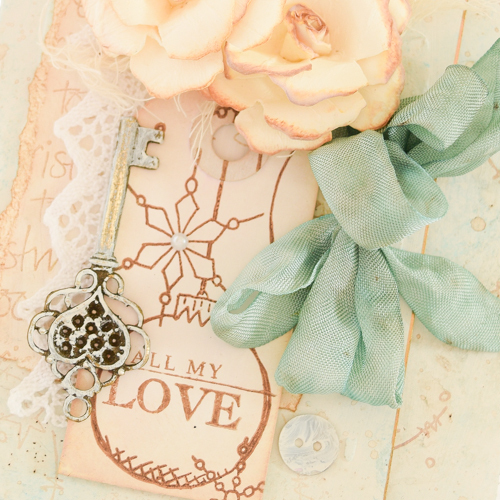 Tonight I wanted to share a few possibilities with these gorgeous JoFY stamps, and for those who know me and know that my usual style is mixed media shabby vintage, then you will realise how I was really challenged! But Jo's stamps are so versatile as I hope you will agree. Let's take a look at each set in more detail, and some ideas with them to inspire you. 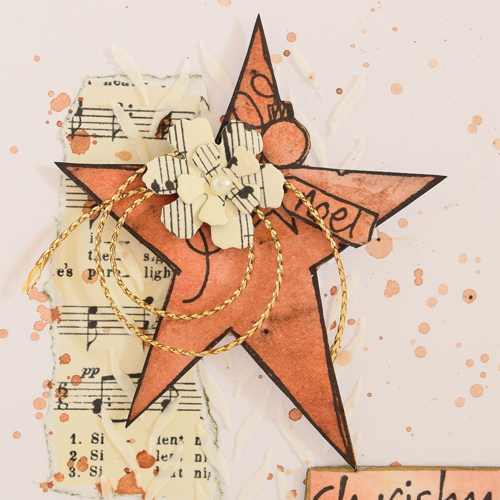 I really fell in love with this little star stamp and knew it would be great for layering over some of my usual elements. I don't normally do a "production" run of cards, but I thought this little design would be easy to replicate in multiples. The card is 4" x 4" which I always feel is a lovely size - not too big but can still pack a punch especially if you use a non-festive colour as I have here (Rusty Car Infusions). I always love being able to isolate a part of the stamp to add elsewhere and the little Noel label was just perfect to cut out and add as part of the flower cluster. You will also see that I have used the word "Christmas" from the lovely sentiment. 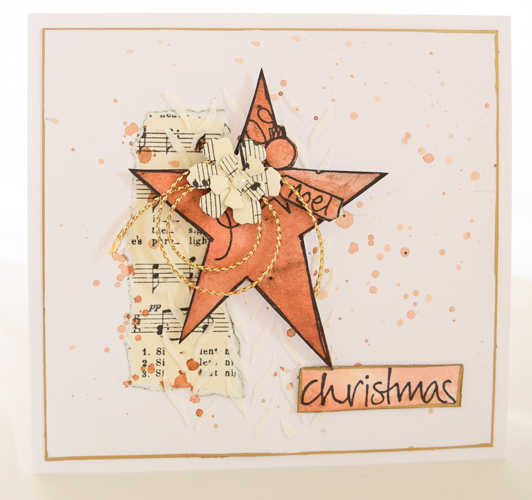 If you prefer a more seasonal colour the design works jut as well with Tinned Peas Fresco Paint brayered onto Smoothy Cardstock. 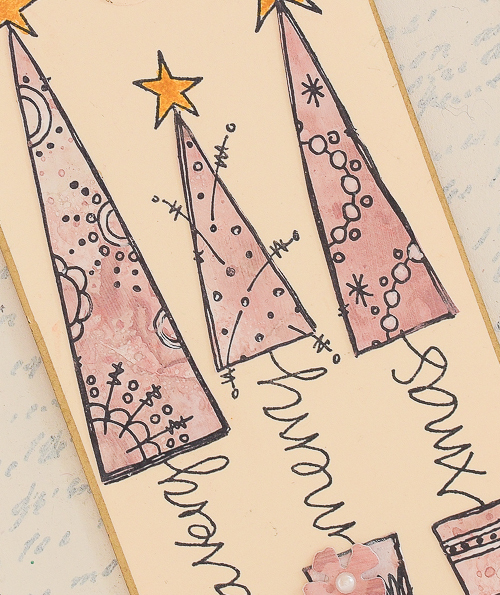 I also loved the Christmas tree stamp from this set - it is just SO gorgeous. I love wrapping my presents for the female members of the family in tissue paper and ribbon and thought this stamp would look wonderful as a "centre-piece" gift tag. My grand daughter loves anything pink and so she even gets her Christmas wrapping in a very non traditional colour. My pink trees were stamped and cut from a piece of Smoothy Cardstock which had been primed with Chalk Fresco Paint and then coloured with Fired Brick Distress Oxide Ink with lots of water. I wanted a more "wishy washy" colour and as the trees and bases are very easy to cut out and layer onto the original stamping this gave me more control to achieve the effect I wanted. I am very good at isolating a part of a stamp! it is not that I don't like the whole stamp but I do feel that it can still be as stunning using a small part of the detail on a layered background. 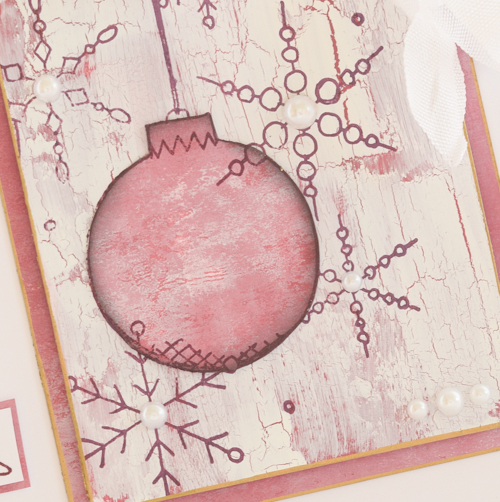 I thought the gorgeous bauble and snowflake stamp would look fabulous on a crackled distressed background. I purposely only used the Crackle Glaze here and there so it would not be too overpowering. 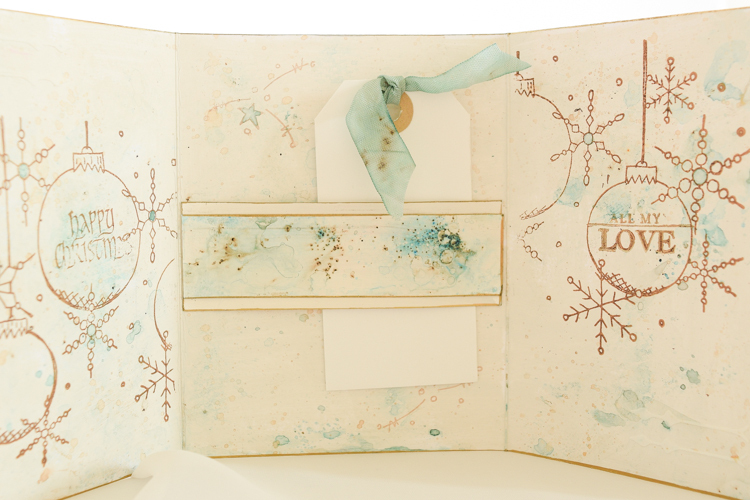 I also wanted to try and achieve the same colour theme throughout the card so have used Very Berry Fresco Paint undiluted under the Fresco Finish Crackle Glaze and then brayered it again with Snowflake for the bauble. Plum Archival Ink also allowed me to achieve varying degrees of the same colour. No matter how hard you try there is always someone that you end up having to give a gift of a voucher or money. However, I like to think I have spent time in making a nice gift wallet to put it in. The large tag is cut from Heavy Smoothy Cardstock and primed both on the inside and outside with Chalk Fresco Paint before going in with the Infusions. I wanted to use vintage style elements and ink and find they work well with A Bit Jaded, which also has a festive feel to it. 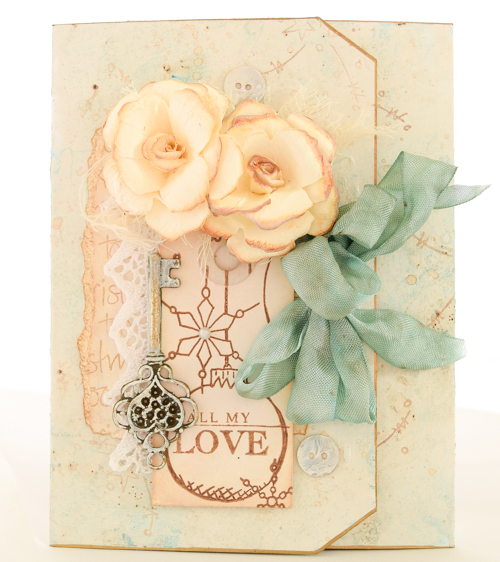 I wanted to layer some text under the tag and used one of the sentiments stamping it lightly on a piece of primed cardstock. (I do find that if you start one element of the project with Chalk Fresco primed cardstock you need to do it for all the elements in order to maintain the same soft colour.) 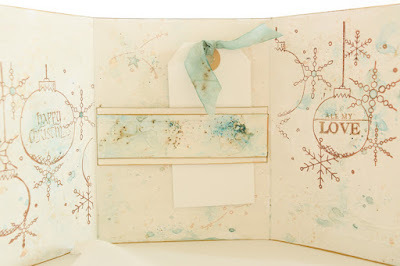 I love Jo's writing style and so this gave a more free-style feel to the card. 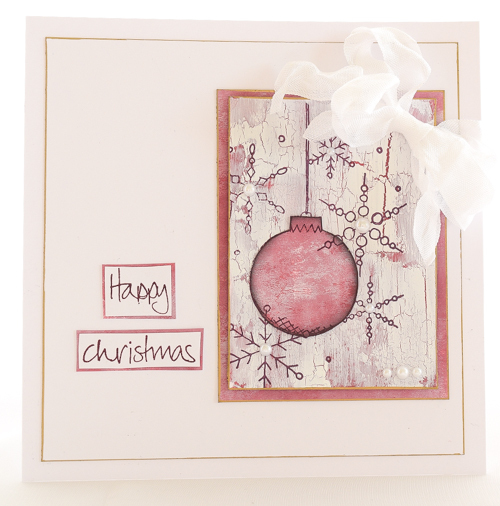 The baubles are the perfect size for some additional stamping with sentiments to make it more personal. I have followed the same theme through to the inside creating a little pocket for a message tag and the voucher or money. Some wonky and not very good stamping here! but that's why I like to do shabby! 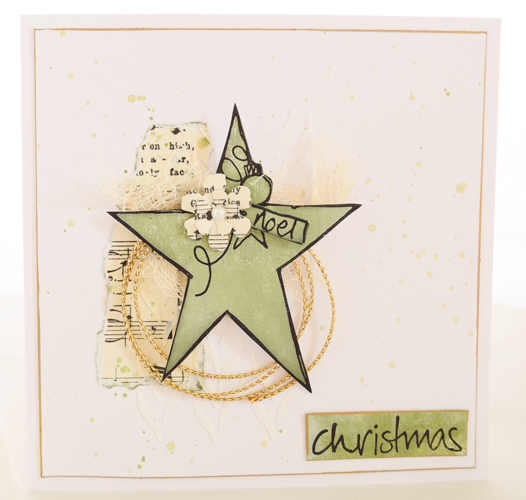 I do hope that these few samples have given you some ideas and shown how versatile Jo's wonderful stamps are as well as working wonderfully with non-festive Infusions and in my usual vintage style. It has been great fun and they are all wonderful stamps to create with. As always thank you for joining me. Theses products are available now from your regular PaperArtsy approved stockists listed below. We encourage you to support independent retailers; they offer you valuable expertise and a wide range of product choice. Wow! Jennie, these are all beautiful! Jennie, you have used the stamps so differently, these are gorgeous! Oh Jennie, your usual vintage and soft style really shows.... fantastic samples. Lovely colours you have used Jennie. Love the star cards, they are beautiful. Very different to usual style Jennie! Beautiful samples. Soft and beautiful, which is very different from the bright design on the stamp package. These are so delicate and pretty, Jennie... I've been sorely tempted by that sweet trio of trees, and seeing you create such lovely cards here is adding to the temptation!